Private, impressive and stunning uninterrupted view to the sea from the lounge and master bedroom the whole frontage of this house is glass to take in the view of the ocean from every room... Bi fold doors fully open onto a private deck which has a full view of Muriwai Beach and the ocean. 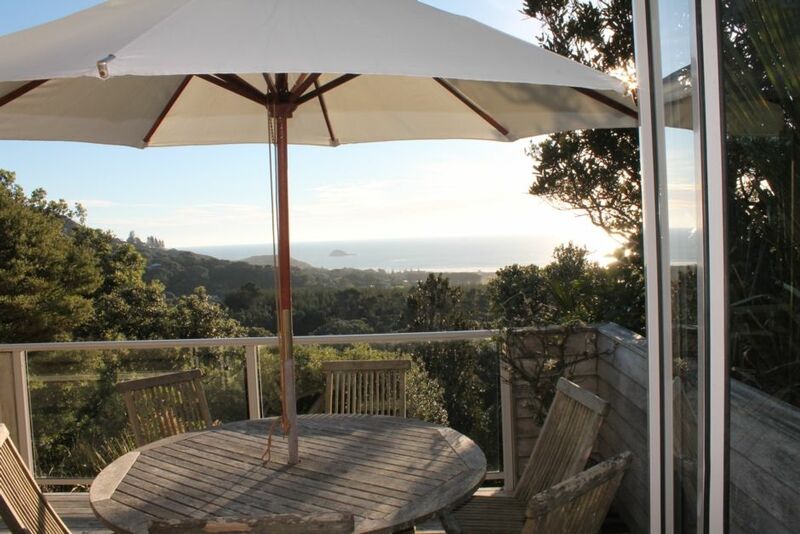 Sit on the private deck surrounded by nikau palms with only wood pigeons and tui's for company. Flat screen television with free view, large lounge seating...off to a dining area and kitchen which all look out to the sea and Oaia Island. Kitchen fully equipped with dishdrawer and large fridge, all modern fittings with built in pantry and island bench with stool seating. Master bedroom has a king sized bed with en suite and ocean view from all of upstairs areas. second bathroom on the first floor with vanity, bath, shower and toilet. Crisp linen on the beds with duck down duvets and enviable bed covers and eiderdowns. Carpeted throughout thick luxurious carpet blending with white walls and surrounding arts. Convenience store and cafe 2 minutes walk down the road. A short stroll to the beach, gannet colony.. golf course.. tennis courts.. mountain biking and wonderful walking tracks a short drive away...World class surf breaks. Waimauku and kumeu witth a award winning winery's and cafe's only 10 minutes drive. This property is a perfect place for wedding party to stay and get ready before wedding or honeymoon retreat, a place to relax and get away from it all. Can also put you in touch with another property owner close by to the glasshouse if you have a big group and require two houses close for hire. NO PARTYS OR VENUE HIRE. The photos of this house really don't do it justice! The photos of this house really don't do it justice! It is an amazing location, beautiful views out across the bush to the sea, and felt really private. The kitchen was well-appointed, and the living & deck area had a great feel with plenty of seating. The carpet was also really lush! It was lovely to walk on. Really enjoyed my stay here, and was a perfect 'Home Base' for my wedding in Kumeu. Beautiful property and well maintained , well equiped . The colour of the water was very off putting although we knew from Nicky's note it had been through a filter so we're happy to have it in hot drinks , had to buy drinking water . We were unsure water to do with recycling and rubbish , so specific instructions would have been helpful. But over all had a wonderful stay , thank you Nicky . The place itself is beautiful and the view of the beach is present, very relaxing. The place itself is beautiful and the view of the beach is present, very relaxing. Enjoying the deck at night may prove to be difficult if insects are not your thing, closing the door is recommended to avoid them coming inside. In the wet, the driveway and stairs are rather slippery and caution is advised. Also the rain will cause the water to be coloured but we were assured it was safe to drink. Thanks. Lovely location in Muriwai. Quick drive to the beach. Excellent views, plenty of space to spread out and relax as a group. Absolutely beautiful view, through native bush out to the sea, with gorgeous sunsets and lovely scene to wake up to. The house makes the most of the view from the living and master bedroom areas in particular, with a great deck to sit out on and enjoy it all from, along with native birds in the trees. Lovely, modern, comfortable house, made for a truly fantastic, relaxing stay. Felt a lot longer than 2 nights!